If you love beet greens, you can practically taste this photo! Fresh-picked, sauteed just to wilting in olive oil and butter, with a smashed and chopped clove or two of garlic, salt and freshly ground black pepper. Heaped on a plate. Topped with a couple of poached farm eggs. It’s hard to imagine anything easier to cook and more perfect to eat. The greens from the first planting of beets—Kestrel (above) and candy-striped Chioggia—are just sizing up. They can be harvested at any size, from quite tiny for eating raw in salads, to huge, for cooking. I’ve never grown beets just for the greens, they come from thinning the plants, which usually happens when the leaves are 4-6″ (10-15cm). life makes sense? That is a good feeling. I am feeling it vicariously! I still can’t get into beet greens. I keep trying though. love them lightly steamed with some olive oil drizzled and a good splash of lemon! 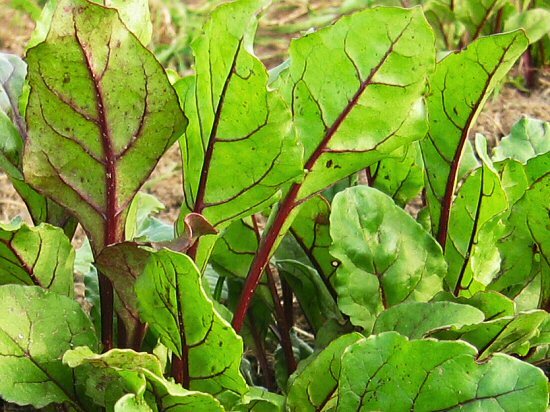 Your beet greens look great. Mine have had a horrible infestation of leaf miner this year. I have done a second planting to see if late planting helps avoid them. I’ve never tried beet greens, but your description makes them sound yummy. You are right, I can almost taste that picture! Beet greens and Swiss Chard make a GREAT green. I love it cooked the same way I would spinach! Good stuff! I discovered beet green this summer, through eating the thinning of my rows of Chiogga. Delicious indeed! I use them alongside lettuce in salads. However, I have a problem with my Chiogga beet: I hardvested a few, at 2″ diameter. They taste a bit strong, remiscient of radish even, when eaten raw. I suspect an imbalance in my soil (heavy clay loam), and was wondering if other people experienced the same problem. If yes, any suggestion as how to “fix” this problem? Another good way to eat our beet greens is to steam them in a frying pan with some bacon, onions and mushrooms! It is to die for. We grew them last year and enjoy the greens more than the actual beet I think : )..Keep on farming!